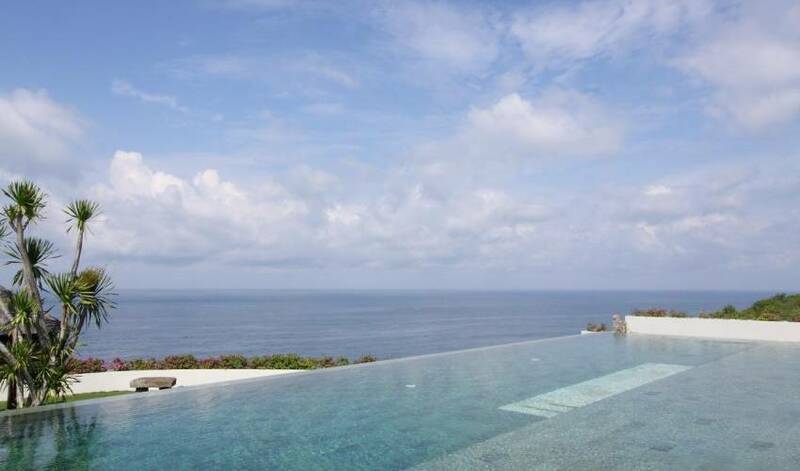 Villa 3387 commands a spectacular view on the ocean from its front cliff situation. 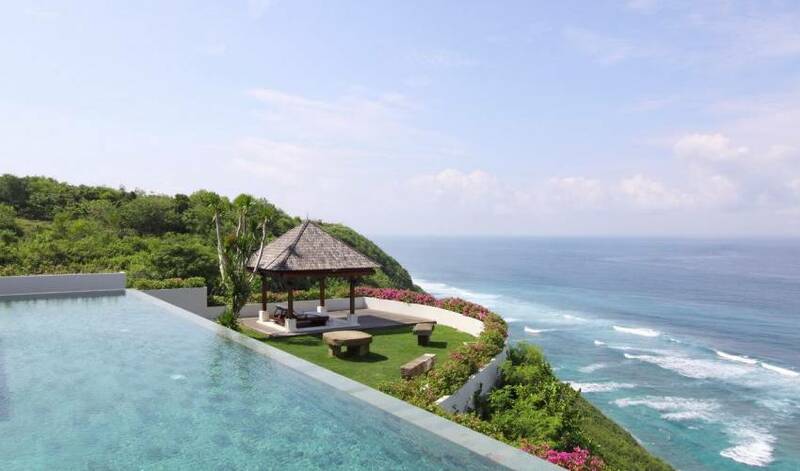 The villa is built on two levels: The upper one offers a quiet living space for the bedrooms and the garden ; The ground level is devoted to the reception rooms, the majestic infinity pool and the rest deck on the cliff. 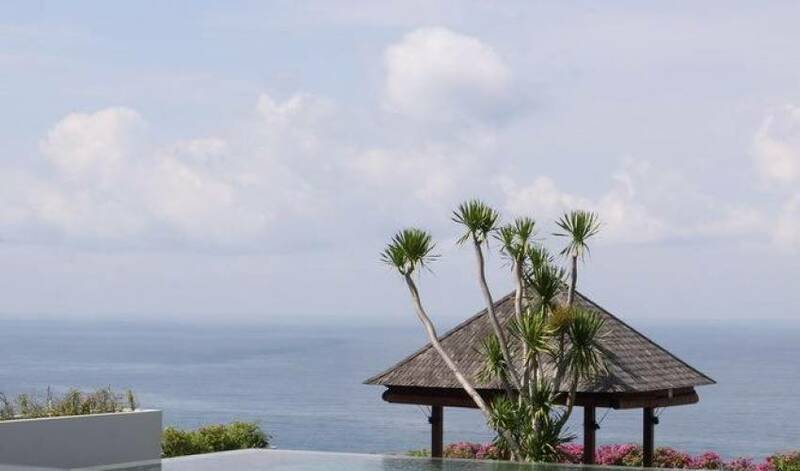 Designed by a decorator who fell in love with Bali, the villa is like a living gallery with its statues, its works of art coming from all over Asia and its water features. Spread on 3 000 square meters of land, it offers many places to relax on terraces overlooking the sea or under shady pavilions. And the magic goes on through the night when the villa lights up and the stars are reflected on the large ponds around the villa. A place to rest and contemplate, that welcomes up to 12 guests. Independent staff premises and garage for 2 cars. Entrance and landscaped garden with water features. Veranda pavilion with BBQ area. Ganesh suite apartment and its pool. Joglo entrance in the villa. Four en suite bedrooms, with terrace and view on the sea. One bedroom suite with its terrace. Covered terrace overlooking the garden and the pool. Pool size 21 x 10 meters. All bedrooms with air-conditioning, walk in wardrobe, safe, private terrace and reading bench. Media room with flat screen , DVD/CD/MP3 player and surround system. Wi fi internet connection on both levels of the villa. Fax available at the Sinaran Surga reception. Spa Pavilion with two massage tables. Diner location on demand (BBQ pavilion, dining room, garden). Private stairways to the beach. A reception pavilion for concierge services. The villa offers five en suite bedrooms in the villa itself and an independent garden apartment suite. Each one is personalized according to the name of a God or a Goddess from the Ramayana. All of them are spacious and traditionally furnished, enjoying the freshness of the palimanan stone tiles and the comfort of air-conditioning. They exhibit a collection of Batik and Songkat panels on the wall and various antiques to give each of them a particular atmosphere. They are completed by a vast dressing and a double basin bathroom. Located on the front of the villa, they offer a scenic view on the ocean to any guest laying down on the four-poster king-size bed. They are completed by a bright inside bathroom. 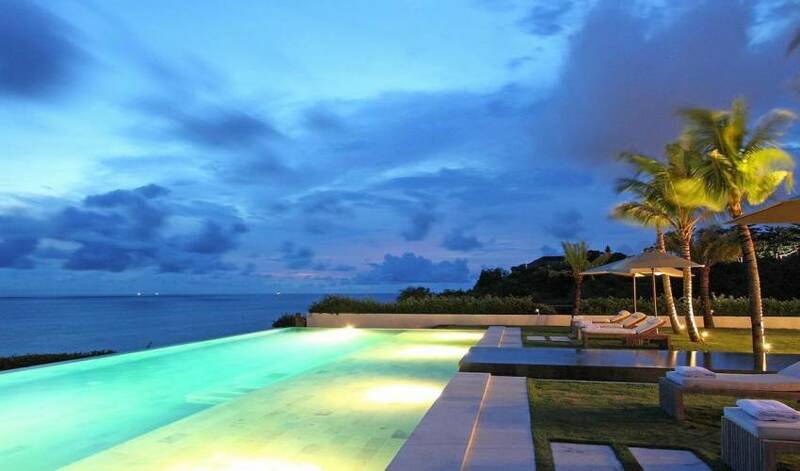 Adjoining is a terrace, to be lulled by the sound of the surf against the cliff. Standing back in the villa, these bedrooms offer, one a king-size bed, the other one two single beds. Both have the view on the sea from their own terrace, where stands a built in terrazzo tub to enjoy a romantic bathing experience. This large and bright suite is surrounded by bay windows overlooking the garden and the pool, with a panoramic view on the sea. It offers a king-size bed and a fully inside bathroom. This totally independent apartment studio is accessible through the main garden. Adjacent to a charming little yard with it plunge pool enlivened by water features, it offers an extra large bedroom with a four-poster king-size bed, prolonged by its personal bar, dressing and inside bathroom. The central staircase, after crossing a pond ornamented with water flowers fountains, leads to a vast living and dining room overlooking the pool and the ocean. Under a timber roof of gigantic proportion, a comfortable lounge corner is facing a wooden diner table accommodating easily the 12 guests. The lights effects at the end of the day, notably the impressive chandelier hanging from the ceiling, gives the villa a permanent party atmosphere. Surrounding the living are on one side the media room, fully equipped with a flat screen TV, and on the other side, a floating glass bar to enjoy the cocktail menu served by the staff . Guests can enjoy two different worlds within the villa. The breeze and the view of the ocean at the lower level. The quietness of the tropical garden at the upper level. 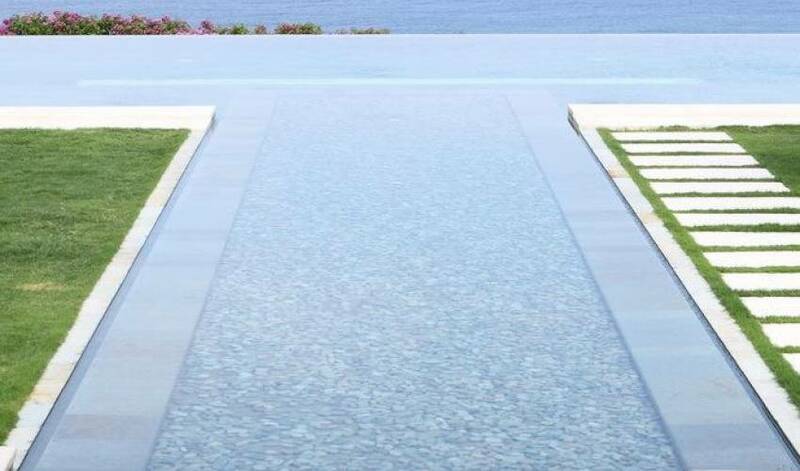 The immense pool (21m X 10m) offers a large low deep pool on the front border to lay down and sunbath in the freshness of the water. 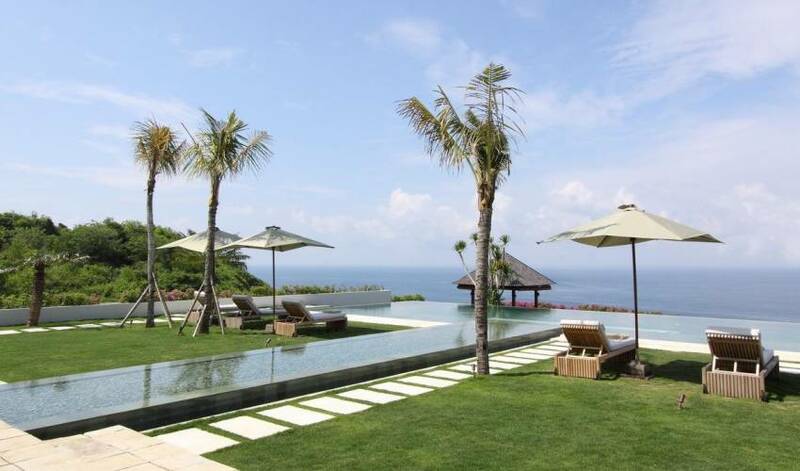 All around stand pool lounges and a typical bale to gaze at the sea under the shadow. On the edge of the cliff stand a wooden deck to enjoy the most dramatic view on the ballet of waves against the coral reef. Probably the best place to savor a drink at dusk and admire the magic of a Balinese sunset. Set back from the cliff, Villa 3387 offers the comfort of a shady terrace to lay on a rest bed or have casual meals around a table. Encrusted in a lush garden stand two pavilions, sheltered from the wind and the brightness of the sea. One pavilion is devoted to the BBQ meals served by the staff with the fresh seafood and vegetables just bought from the market. Adjacent stand a veranda lounge for a drink or a quiet reading. Another pavilion accommodates the spa, with two massage tables, a shower and a large lava stone tub for treatment bath. Opened on the garden, but well protected by tropical plants for privacy, the place provides a rare sense of well being. 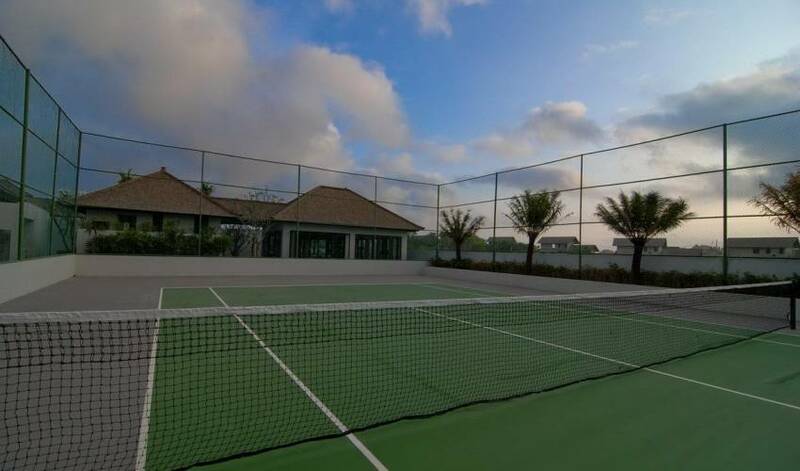 The estate and villas are managed by an independent team attached exclusively to the estate. We are taking a special attention to the quality and variety of our cooking offer, by presenting menus catering to all tastes, from the breakfast buffet to the all Indonesian diner, including children and western menus. In villa spa treatments, including therapeutic massage, body scrub, body wrap, face mask and manicure. Personal trainer for Gym and Tennis. Balinese dancing show in the villa. Touristic tour with a guide.